Dr. Jinhua Shen from Xinjiang Astronomical Observatory analyzed variety of dynamic behaviors for the flaring and peripheral magnetic loops of the M6.6 class limb flare that occurred on 2011 February 24 from extreme ultraviolet observations by the Atmospheric Imaging Assembly(AIA)/ Solar Dynamics Observatory (SDO)and X-ray observations by RHESSI. The related paper has been published in The Astrophysical Journal APJ（http://iopscience.iop.org/0004-637X/791/2/83/）. They believed that formations of flaring loops are involved in the magnetic reconnection processes by study. The flaring loop motion confirms the earlier contraction-expansion picture. In this paper, they also found that the U-shaped trajectory delineated by the X-ray corona source of the flare roughly follows the direction of a filament eruption associated with the flare. 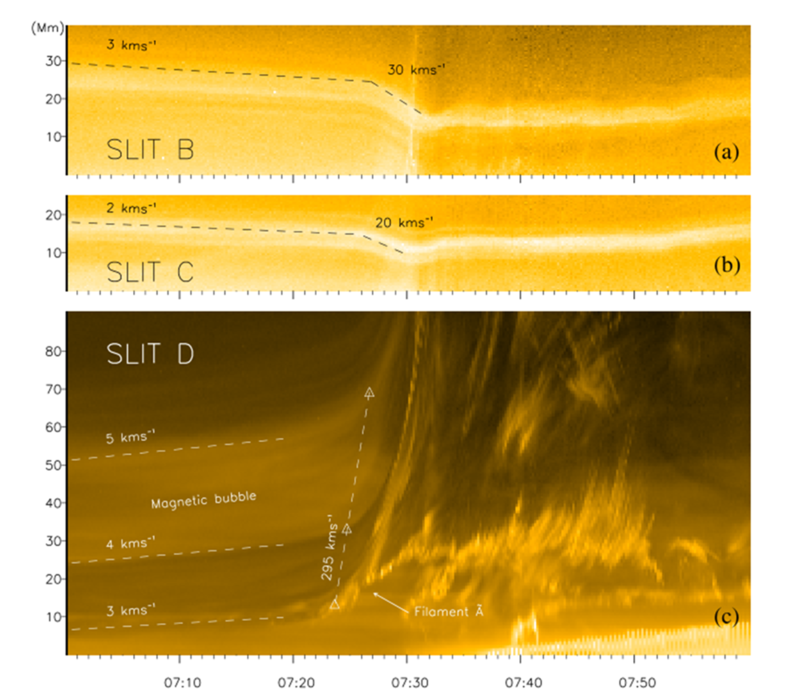 Meanwhile, different temperature structures of the coronal source during the flare eruption strongly suggest the different kinds of magnetic reconnection processes. For some peripheral magnetic loops, they thought that its dynamic behavior is closely connected with filament eruption. During the slow rising to abrupt, fast rising of the filament, overlying peripheral magnetic loops display different responses. Filament activation and eruption play a dominant role in determining the dynamics of the overlying peripheral magnetic loops. Earlier studies were only confined in corona magnetic loops of full disk. Through the observation from high resolution for this flare, they not only revealed the response process between the flaring loops and the corona magnetic loops via the filament eruption, but confirmed the physical mechanism of “magnetic implosion” during flaring eruption. The space-time image shows the response between the flaring loops and the corona magnetic loops via the filament eruption, as observed by SDO/AIA EUV 171 A°.